After months of planning and “yard work,” a newly designed formal garden at Waveny House is in place and residents say they’re enjoying it. 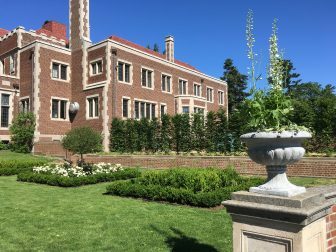 Those visiting the town park can now use additional benches as they walk through new plantings, boxwoods and shrubbery along the northern wall of the “parterre garden,” just east of the balcony behind the mansion. “Sitting on the back patio of Waveny and looking down at the parterre, you are transported to England or France,” said New Canaan Garden Club First Vice President Manda Riggs. New Canaan resident Cassidy Little visited the garden on a recent afternoon and is looking to use it as a backdrop for a photography project. New Canaan Garden Club President Ellen Zumbach appreciates the “fresh and new” turnout of the parterre garden and notes that it enhances other Waveny amenities. Back in February, the Board of Selectmen approved a pair of contracts that allowed the New Canaan Garden Club and the Waveny Park Conservancy to move forward with the controversial redesign of Waveny’s parterre garden. The Garden Club’s plan garnered the support of the Waveny Park Conservancy Chairman Bob Seelert as well as Parks & Recreation Commission Chair Sally Campbell. Pushback was ongoing from Keith Simpson Associates which advocated for a historic restoration—yet, the Club ultimately moved forward with their design. 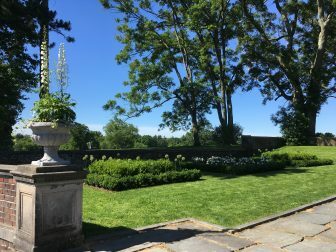 The development of the garden’s design was a process that required time and care, as the Garden Club was careful to respect the original layout of the Olmsted Brothers firm and founding member Antoinette Lapham, officials said. The garden was donated to the town of New Canaan by the New Canaan Garden Club and a grant from from the Harlan E.and Lois J. Anderson Family Foundation through the Waveny Park Conservancy. To visit the renovated parterre, walk east of the wide balcony out back of Waveny mansion and continue down toward the walled garden and sledding hill. Can someone explain why the Garden Club chose not to reproduce the original planning plan, laid out by the Olmsted Brothers for Antoinette Lapham? Much thought, discussion and review went into the Parterre Garden design with financial support from the Garden Club and the Anderson Family Foundation. The garden had fallen into disrepair in the years following the Town ownership. The simple re-design on the same footprint to honor the original garden was both classical and practical from a maintenance viewpoint. Recreating the Olmstead Bros. design was not possible since the Waveny Park Conservancy does not have an extensive staff of gardeners such as the Laphams once employed. The redesign was correct for the next 100 years.